Soft Experience software editor provides Windows file management products and prepress solutions such as KaliNews, Kalimages, Idem, Catalogue Files Metadata Miner, Delenda, MacNames, CrossIPTC to automate documents and images processing, save time, make cross-platform exchanges easy. Smart tools for everyone with content management functions: pre-media editorial system, images captioning and searching, file synchronization & backup, Macintosh file management on Windows platforms, automation of old files suppression, metadata editing and extraction. Kalimages, the innovative photo database tool to quickly caption,catalog and search digital images by keywords using IPTC/IIM, XMP metadata standards and controlled vocabularies without technical skills. New: Kalimages PRO : create a professional image database using standard IPTC and et XMP data indexation for full text search. Software to rapidly synchronize files or execute a directory replication with ease. Renaming the Macintosh filenames for PC adding automatically the proper extension when shared on a Windows NT / 2000 / XP server volume to allow PC and Mac integration - avoid to have forbidden Windows non supported characters. MacNames is also available as a Windows NT or Windows 2000 service to convert Mac file names to PC or shortening filenames from PC to Macintosh in an automatic way. Determine deletion date, how long to keep documents and remove obsolete files automatically when they reach the time to maintain folders up to date, deleting or archiving old files. software to erase or move files older than a certain number of days daily and automatically. Microsoft Office, OpenOffice.org, StarOffice, Visio documents, Windows 2000 files, PDF documents information, IPTC fields for JPEG images, XMP of Adobe documents. Allow for file properties to be read and export into a manipulative format with the new XML export format, then other applications can integrate or transform this content. Easy creation of HTML page cataloging folders and file properties to get more than names from your files. 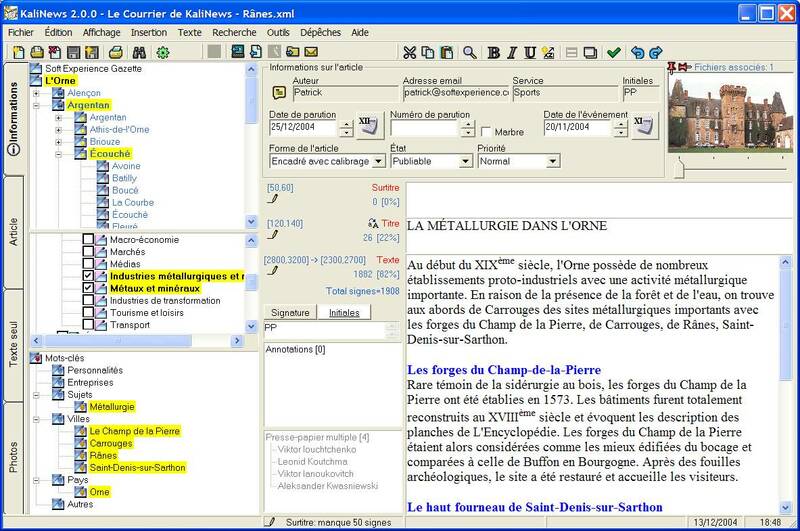 The purpose of this French page is to help readers approaching metadata concepts, recommendations and initiatives. It presents several fundamental techniques related to Metadata (Dublin Core, RDF, XMP), detailing particular those which are applied to the images (IPTC, EXIF, DIG35, JPX) and to press (PRISM, NewsML, NITF). Creates extended listings of folders contents in interactive mode and command line use for integration in a documentary system: Automatic extraction of metadata from documents..
Metadata Miner Catalogue PRO also enables Adobe XMP file information (eXtensible Metadata Platform) metadata extraction from documents produced by recent Adobe applications and XSL transformation on metadata extracted listings converting to Dublin Core RDF, CSV, SVG and other custom presentations for common uses or in a Content Management System Architecture - ntfs properties export, pdf properties list, windows 2000 file properties extraction. Allows companies to quickly gather summary information from MS Office, Adobe documents & other source documents and easily move that meta data into XML file or post it on shared drives as an HTML catalog with index of file documentation for project team members with easy files access via hypertext links. Enables automatic cross-platform stock photography conversion via a mass repair on IPTC File Info fields added to JPEG or TIFF pictures: translates Macintosh accents to Windows and Windows to Macintosh including an XMP cleaning utility. Facilitates images, digital photos transmission & exchange between platforms. Disableclose window button manager to avoid close programs without proper exit. Set a window topmost to be always on top in front of all other, Deactivate close X button automatically. Create, keyword a photo database to catalog and search huge number of digital camera pictures without technical skills. See how to start with Kalimages Automatically compress/uncompress files preserving streams and Macintosh files integrity when transferring data via email or FTP. A WinRar companion tool. Console utility to collect summary informations (properties) embedded with all Windows 2000 files. It deals with the collection of Microsoft Office documents properties (and Macintosh comments stored on NT/2000 volumes) exporting collected information into a text file for future use by another application. Are you having trouble keeping track of last users that modified a file? BriefAudit can be set up by network admins to set this report document changes history into comment file property for later auditing. A Windows 2000 or Windows XP Shell extension adding Macintosh files information display on Windows Explorer tooltips . EasyConsole can save your Dos command lines on GUI buttons to be used again just with a click instead of typing all text again ~ like a post-it, remember last DOS commands used. Navigate files and folders with a Windows interface while issuing commands via a DOS shell. Runs a slave MSDOS console, stores last used commands for future use saving time. Displays Type and Creator codes of Macintosh files using WinNT Explorer. Eliminating bulky boxes allows us to provide the software for a lower price, saving natural resources and providing always recent versions available for download. Help files are included within setup and additional documentation on the web site. The matter of syntax and semantics of computer programs shows much of the old spirit of the Greek geometry. It describes constructions (computer programs) and proves that they actually achieve what is promised in the program specifications. N. G. De Bruijn, On the roles of types in mathematics, in The Curry-Howard isomorphism, Cahiers du Centre de Logique 8, Ed. by Ph. de Groote, Academia, Louvain-La-Neuve, 1995, p. 48. Partner Links Book Store Visit here You may mail this website URL to your partners or friends! We are also offering some program for Free. You may download them, use and send the information to friends or partners as an invitation to get professional software at affordable cost. Our aim is to let you test these solutions for your personal or business use before you buy. You can order them online using credit cards on a secure server , via bank check in Euros or Wiretransfer.